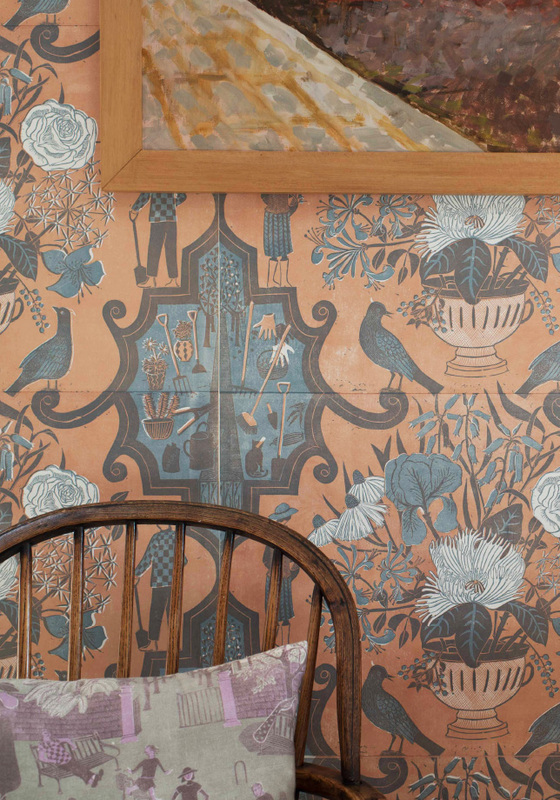 Wallpaper, according to Marthe Armitage, “should be seen and not heard. 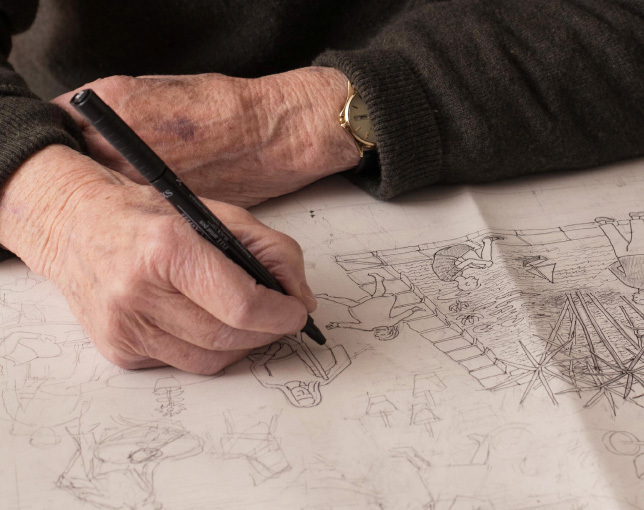 It should provide a background in a home, and should not make you feel you have to look at it all the time.” Although that is probably the very thing that anyone who sees her designs wants to do. Described as enchanting and mystical, stimulating or calming in equal measure, Marthe’s designs draw the eye into fabulous landscapes of imaginary lands and elegant gardens, following along a stream, a pathway, or an intricate entwinement of leaves and flowers in a botanical paradise. Hop tendrils twirl about a stem, broad chestnut leaves fan out on an invisible breeze. There is a sense of birdsong within the foliage, the touch of morning mist on the delicate wheel of a newly spun spider’s web. Marthe seeks inspiration and information in the natural world around her, as well as in her collection of beautiful books on plants, gardens and art. Speaking of her “desire to tell about what is so pleasing about the world,” living plants are studied and drawn with keen observation and artistic mastery. Not just the form of flowers, but the important spaces between them, the promise in a swelling rosebud, the fall of light across the veins of an individual leaf. There is the sure hand of accuracy, understanding and realism, but there is also the charm of imagination and creativity. Repeat is at the heart of wallpaper design, and plants go easily into repeat according to Marthe. But her intricate designs and landscapes are the product of exceptional imagination, almost mathematical in the elegance of their solutions. A design can take Marthe up to several months to devise, draw and then cut out on a lino block, using a v-shaped tool called a gouge. Sharp, (and not without inherent risk of slips and cuts, to the lino or fingers alike), this is a simple implement with tremendous versatility in the right hands. It affords the possibility of changing the depth of cut, and hence the intrinsic nature of the resulting effect in print, with a simple change in pressure applied by the artist. 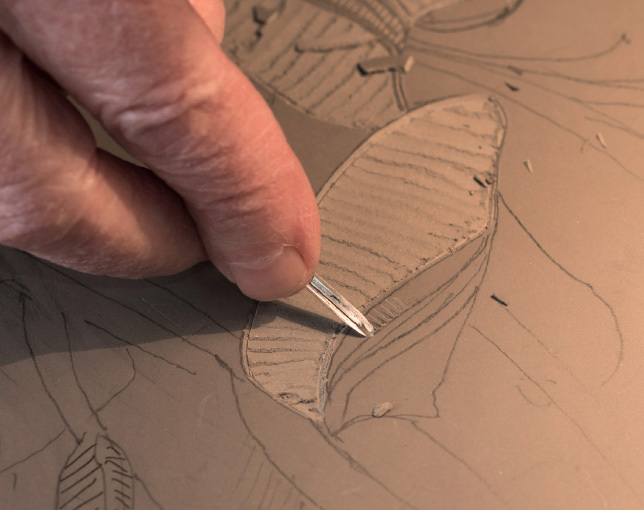 It can produce the finest etched lines, for example the texture of a gravelly path or ripples on water, or be used to create larger spaces, cut out to reveal the primordial, clean simplicity of a ginkgo leaf. 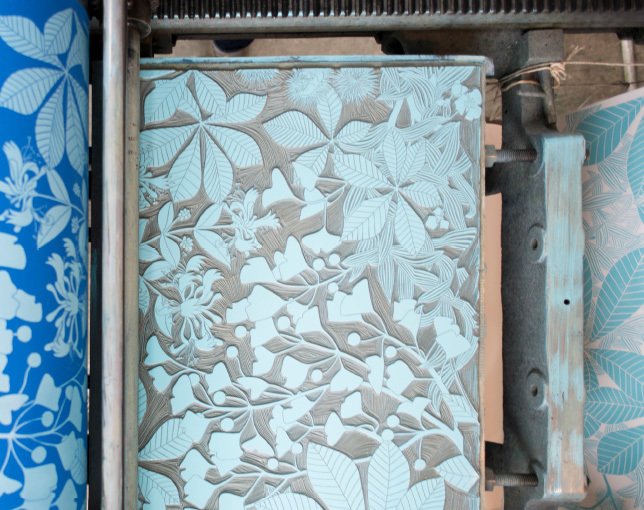 When complete, the lino block will be affixed to a metal plate, ready for use on the printing press as required. Linocut printing is a process with provenance. Used by the Die Brücke group of German Expressionists in Dresden in the early 20th Century, it was also popular with such artists as Escher, Mucha, Picasso and Matisse. Lino itself started life in the 1860s as a plain, hard-wearing floor covering made from natural materials such as linseed oil, pine resin and wood flour. The patented creation of Frederick Walton, its original production was based at British Grove in Chiswick. Today in Chiswick, at Strand on the Green, this humble material is still the starting point for so many intricate, beautiful designs by Marthe Armitage.